I’m heading out for the Cocktail Party this morning, which means that posting, like my sobriety, will be sporadic at best. Whether you’ll be down there with me, or watching the game from home, enjoy yourselves. Injuries, mediocre records or whatever, it’s still one of the crown jewels of college football and we’re lucky enough to claim it for our own. Last week Georgia’s injury report included 24 players, including 13 who had started at least one game. After Wednesday’s practice it was down to 12 players, five of whom have started at least one game. Meanwhile, Florida will have eight starters out with injuries. When it comes to giving the big schools more say in how they spend their money, “autonomy” is the new black. It’s thinking like this, that… well, gets you intercepted three times in a half. Much of the reason for the conservative offense at Vanderbilt was the attrition at receiver. Quarterback Aaron Murray admitted before the game he was still developing a “trust” with the receivers now thrust into the rotation, and the trust still wasn’t there at Vanderbilt. Of course, the receivers didn’t do a great job of getting open either. Still, Bobo appeared to be putting the onus on Murray, even if it means some gambling. That’s even against Florida’s talented secondary, which leads the SEC passing yards allowed, third-down defense, pass efficiency defense. I’m the first to agree that the playcalling against Vandy was constipated, but there’s such a thing as overcompensating. Then again, this could be Bobo’s way of playing mind games with the Gator defense. In either event, I sure hope Todd Gurley has a helluva game. Georgia’s opened up the competition at punt snapper again. I don’t have a problem with competition, even this late in the season… but why stop at two? If Tennessee could pull a place kicker in from a frat house, you’d think on a 30,000-plus person campus Lilly could find somebody to walk on and snap the ball. Some of us have said that all along. I guess the weather and the travel don’t look as bad on the other side of 3-18. 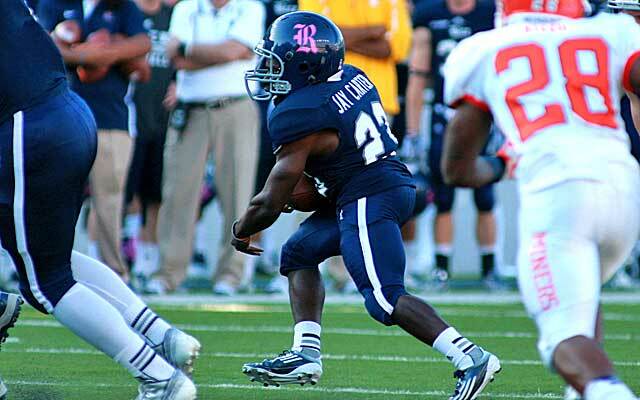 Gregg Doyel has a good story about the 4-foot-9 player who got into a game for Rice last week. So does some other stuff. Like his dad, Jayson Carter is athletic enough to have excelled at three sports — football, baseball, track — at KIPP Charter School in Houston. He can bench press 315 pounds. He runs the 40-yard dash in 4.5 seconds. He has a 30-inch vertical leap.